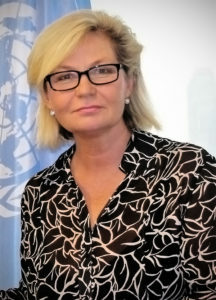 UNDEF Executive Head Annika Savill - Gesichter der Demokratie! Domestic politics and geopolitics are challenging globalization as a dominating force, so the pendulum is starting to swing back towards nationalism and nativism. Annika Savill: There is a range of countries where governments or segments of society no longer see an independent and impartial media as an essential part of democracy, but rather, as an adversary to be overcome. This undermines the prospects of public debate based on facts, and opens more space for propaganda. Added to that is the increasing and appalling rise in violent attacks against journalists, as well as arbitrary detentions. Many consumers have lost the ability or will to read critically and examine sources correctly. Many people assume democracy can self-correct to accommodate a changing electorate. Annika Savill: Democracy means gender equality. That goes far beyond parliament. In some societies, women are still treated as barely more than the dirt under a man’s shoe. My peripatetic life has made me think about connectivity and language. Over the next five years, I want to explore a theory of mine – the link between global language groups and democracy. Do some languages make a population more connected with the world at large, and thereby better built for democracy? Conversely, do some language groups isolate whole regions by being too self-contained, thus caged in a linguistic echo-chamber and stuck in a sclerotic system? Ms. Savill, thank you very much for the interview!